Kye Stevens believes his victory at Shock N Awe 28 was his best to date. 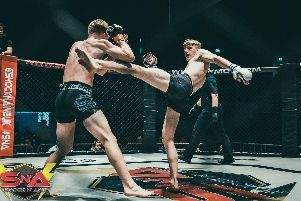 The Havant ace moved his amateur record to 3-1 after delivering a first-round TKO win over George Dalziel at Portsmouth Guildhall on Saturday. The welterweight dominated his opponent who, to his credit, took the bout on short notice. But Stevens, who trains at Fratton’s Gym 01, swiftly ended the contest with ground-and-pound punches within two minutes. The former Warblington School pupil was delighted with his display. Stevens said: ‘Everything on the night couldn’t have gone better. ‘I was happy with my performance – it’s my best to date and I’m over the moon with it. ‘You can’t knock him for stepping in but I had to take it as it came and couldn't change how I wanted to perform. ‘I had to still go in there with the same mindset. ‘In my previous fights, I wanted to take my opponents down to the ground. But on Saturday I went into it thinking I’d try to keep it on the feet. ‘In the first 10 seconds we ended up clinching against the cage. I got the takedown and it went from there. ‘I didn't really want to grapple. I was looking for the knockout – I always look for the first-round knockout – but it happened how it did. Stevens has now targeted the Shock N Awe amateur welterweight title. Keiren Bennett currently holds the strap, having defeated Michael Wareing at the Guildhall on Saturday. Steven, however, reckons he should be next in line for a shot at the prize at Shock N Awe 29 on March 16. ‘I’m 100 per cent hoping for the title fight – it’s my target for the next show,’ added the 20-year-old. ‘I watched the title fight on Saturday and Keiren Bennett, who won the belt, is who I want to fight next. ‘He’s just a stepping stone for me! That’s definitely my goal now. ‘There’s a small Shock N Awe: Contenders show at the Pyramids Centre in February which is all amateurs.